DJ Calvin Riley is a SB native who began DJ’ing in the underground/club scene in the late 90’s. Since then he has taken his tables with him around the globe developing his style and cultivating a world-class performance. During his 15 years of DJ’ing, Calvin has played at some of the more premiere events in Santa Barbara, San Francisco, Seattle, Philadelphia, South Beach and Barcelona, Spain. He has had residencies at SB’s most popular hotspots such as Tonic Nightclub, The Wildcat lounge, Q’s and Sunday Sessions. Currently he is a resident DJ at EOS lounge in Santa Barbara on Saturday nights and “Champagne Club” at Marquee every first Friday. 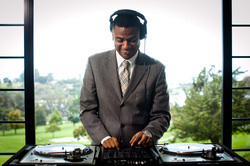 Calvin has DJ’ed many public and private events, weddings, corporate events and festivals. There is no music genre that slips by DJ Calvin. Equally at home with a high-energy house set or an evening packed with R&B, this DJ is sure to deliver an experience to be remembered.